- Ruby quartz is not as well-known as its paler cousin rose quartz. It is distinguished by its deep rosy red color, mixed with veins of gray, black, mauve and brown. The base of this wand is set with a small crystal ball, and the tip has a crystal point. A pair of garnet cabochons add a lovely accent. 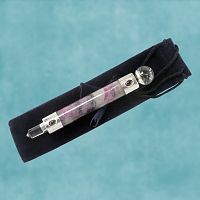 This wand is 4 3/4" long, and comes with a velvet bag for storage. Do you have any other questions about our Ruby Quartz Wand?